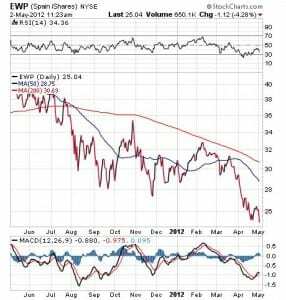 Making Money Alert: Can the U.S. Decouple from Europe? Investing Advice And InformationAudio/VideoMaking Money Alert: Can the U.S. Decouple from Europe? I just returned home from a fantastic two-day trip to Phoenix, Ariz., where I attended a conference for investment advisors hosted by Fidelity. I must say I was extremely impressed by the care and thought they put into this outstanding event, and I want to thank the organizers publicly for inviting me. During the conference, Fidelity brought in numerous speakers and held several great panel discussions with leading economists and money managers. I learned some interesting things during the event, and I want to share a few key takeaways with you, the Alert reader. One of the overriding themes at the conference was the persistent concern about whether the U.S. economy and stock market can effectively decouple from troubled Europe. As you likely know, I’ve been warning you about the dangers present in Europe, as much of the European Union (EU) already has descended into recession. It is my view that the U.S. economy — and especially the U.S. equity markets — will have to pay the piper, thanks to Europe’s fiscal malfeasance. It is very difficult to believe that the EU’s budgetary woes will bypass us in the United States, and fail to have a significant effect on the U.S. economy and markets. Now, most of the Fidelity managers and speakers I heard during the past two days were understandably bullish on the prospects for the U.S. economy and stock market; however, they were bearish on the European economy and on stocks in that region. No surprise here, but what was a surprise was the near-unanimous view that the U.S. economy is facing a plethora of indigenous challenges aside from those posed by Europe. First on the fear list is fiscal policy. Just how long can the Federal Reserve continue to juice the economy with historically low interest rates? What happens when rates rise? What happens when the inevitable takes place, and pernicious inflation rears its ugly, wealth-destroying head? These are all big concerns for those of us in the advisory business, and these concerns represent a big potential headwind for the markets going forward. Other big concerns for the markets here at home are political. The November presidential election is a dead heat right now, according to just about every reputable poll. The uncertainty about which party will seize power next is something the markets are very concerned about. The Fidelity experts know, and I agree, that not much is going to get done in Washington in the months leading up to the election. 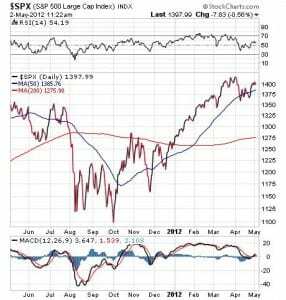 As such, we are likely to see a stagnant or declining stock market through the historically slow summer months. These issues will come to a head later this year. For now, however, I think the bigger concern for the United States is the issue of Europe and the question of decoupling. 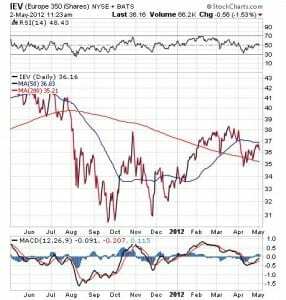 As you can see by the charts below of the S&P 500 Index, the iShares Europe 350 and the iShares Spain ETF, there continues to be a disconnect between the domestic equity markets and the European markets. Stocks in the S&P 500 now trade above both short- and long-term trend lines, while stocks in the Europe 350 have fallen back below their short-term moving average. However, very troubled EU countries like Spain are trading at multi-year lows. This situation is no surprise, given the country’s near-25% unemployment rate and shrinking economy, but Spain also isn’t an isolated case of fiscal unfitness. In fact, the metrics in Europe have become increasingly worse. In April, we saw production figures in the region tumble and unemployment metrics spike. I’ve already mentioned Spain, but Italy continues to struggle, as well. Italian job losses in April were the worst in more than two years, and new orders for manufacturers fell to the worst pace in three years. Even fiscally potent Germany, which is the strongest economy in the region, saw production output drop in April for the first time since last year. Employment in the Rhineland also was down for the first time since March 2010. Germany really is starting to feel the crunch caused by its financially out-of-shape neighbors, so how long will it be before the same thing begins happening on our shores? Twain’s writings are replete with quotable wisdom, but the above gem really struck me today after watching news reports of the May Day Occupy Wall Street protests. If you want to make your life better, then I say stop thinking the world owes you something and start creating and/or doing something that the world is going to benefit from. And remember, you came late to the party. The world was here first. As such, the world deserves your positive contribution.